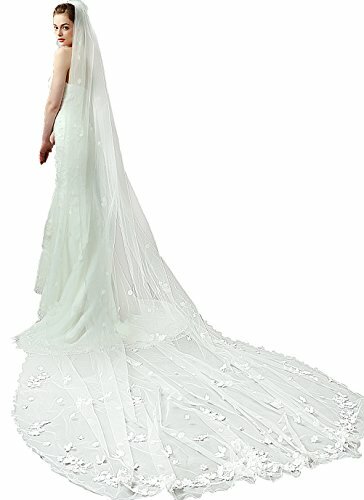 Unique headpieces and wedding gift for bridal and bridesmaid. Fold it to store away when not in use, easy to clean for repeated use. ※Because the computer monitors are different, the color may vary slightly. ※Please confirm the actual size according to our descriptions instead of the photos. ※If you have any questions, please leave your messages, we promise to reply you within 24 hours and offer you best services. Color :beige.Graceful design,Good quality for your wedding. Soft tulle fabric with lace appliques. High quality appliqued lace edge veil with comb. Elegant cathedral length, suit for wedding, evening, or other special occasion. Very Lightweight but Gorgeous Tulle Veil with: two layer; Cathedral Length:approx 157"*118"inch (400*300CM ). If you have any questions about this product by Old DIrd, contact us by completing and submitting the form below. If you are looking for a specif part number, please include it with your message.